Antique Karapinar Rugs – Antique Oriental rugs of Turkish origin cover a wide range of aesthetic idioms. From the more classically composed and elegant antique rugs of Oushak, which feature soft and graceful compositions, to the typically tribal rugs of Bergama, which feature exciting geometric experimentation, there is an impressively varied range of styles of Turkish rugs. Antique Karapinar rugs and carpets are among the more intriguing examples, boasting a very distinct set of design preferences that makes them reminiscent of Caucasian rugs and carpets. In the Turkish language, the term “Karapinar” means “black spring.” While this might suggest a style that is characterized by dark colors and themes, antique Karapinar rugs and carpets are generally characterized by bright and bold colors. Historically, antique Karapinar rugs and carpets have been woven in southern Anatolia, an area in Turkey with a rich and vibrant history in the arts – especially the weaving arts. 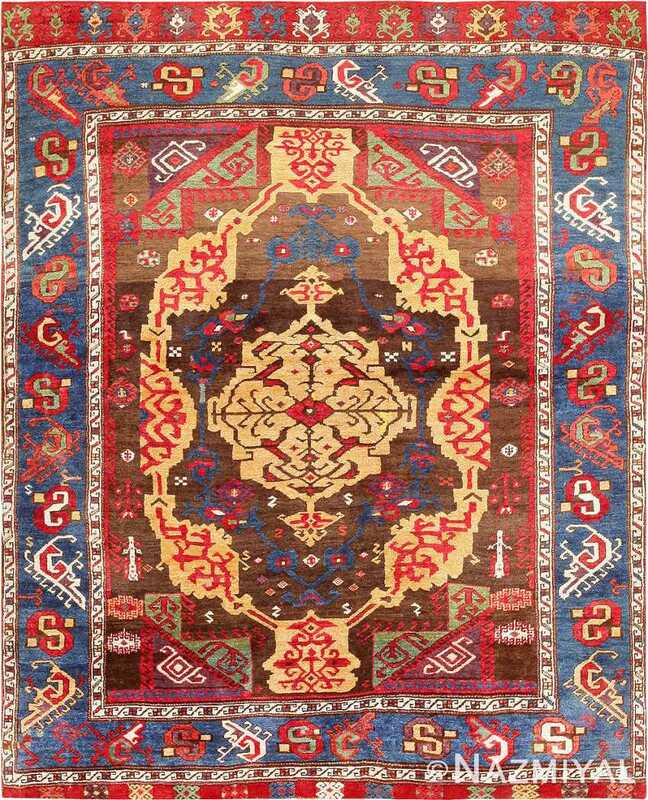 Artistic tendencies endemic to this region are beautifully reflected in its antique rugs and carpets, which often feature geometric and abstract tribal designs. Especially common are geometric depictions of traditional floral elements, which are often presented as highly stylized versions of classic design elements. It is this emphasis on geometric drawing and design that makes Karapinar rugs closer to many styles of Caucasian rugs than more classical Turkish styles. Beautiful and exciting compositions, antique Karapinar rugs and carpets from southern Turkey represent an exciting tribal style that is highly reflective of and representative of that particular part of the world. Antique 18th Century Anatolian Rug From The James Ballard Collection #47373. This 18th century piece displays an unusual and superbly colored medallion with rectilinear spandrels and symbolic space fillers.